Things got lively at Apple’s flagship store in central London yesterday after Greenpeace activists ‘rebranded’ the store, plastering the windows with a poster protesting against the company’s use of coal and dishing out Apple logos made from coal to customers and shop staff. The action followed Greenpeace’s recent “How Clean is Your Cloud?” report which looked at the environmental impact of the growing trend of providing data centres to cope with cloud storage. Greenpeace claims that some Apple data centres consume as much electricity as a quarter of a million homes, and is particularly angered by the construction of a new Apple data centre in Maiden, North Carolina which they say will mainly rely on coal power. Companies like Google, Facebook and Yahoo have shown how global IT companies can use clean, renewable energy to power the services we use – in fact, it was thanks to you that last year Facebook announced its goal of running on clean, renewable energy sources. While Apple has made some encouraging announcements recently, its data centres are still primarily powered by a 19th century technology – coal. 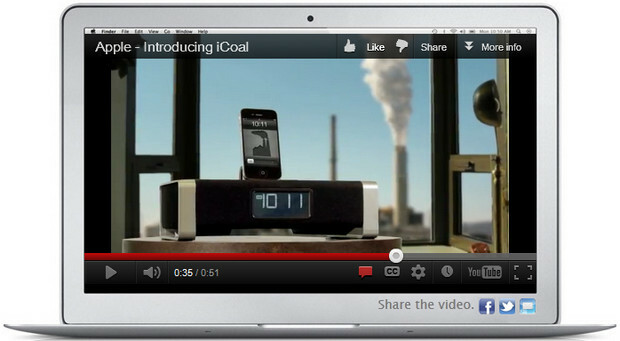 Apple needs to ditch coal power and switch on to clean renewable energy. As visionary Apple founder Steve Jobs famously said “…the ones who are crazy enough to think that they can change the world are the wones who do.” It’s time for Apple to live up to that spirit. Tell Apple CEO Tim Cook to clean our cloud! Apple insist that Greenpeace have got their figures all wrong, while trumpeting their own green credentials, pointing out that they are in fact investing hugely in solar energy. You can sign that one here. We’ve already signed both. These companies are stinking rich, so can easily afford to switch to greener energy. Be nice if they could pay their Chinese workers more too, come to think of it.